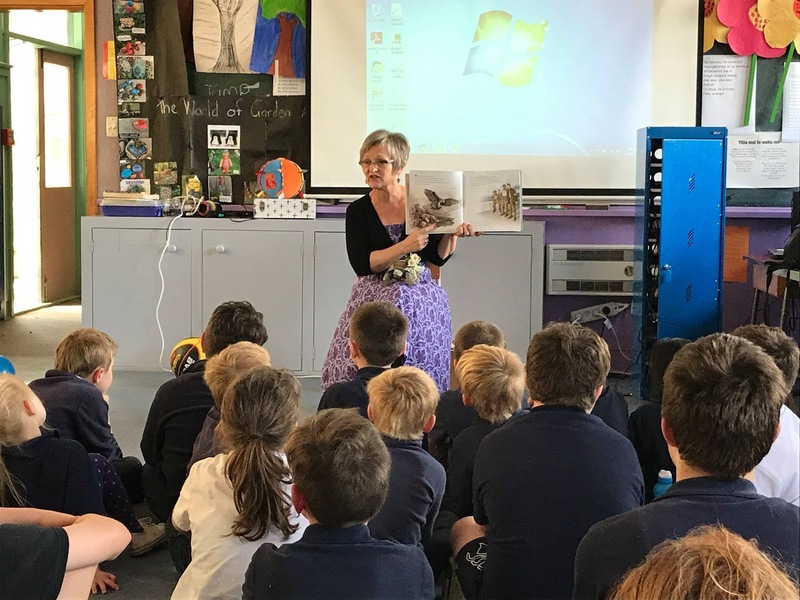 On Friday 22nd September, I finished up my 6 week creative writing programme with Featherston School as part of the Wairarapa Project. Hopefully some of the kids I spent time with are writing stories with good beginnings, interesting middles and fine endings with a host of interesting characters. 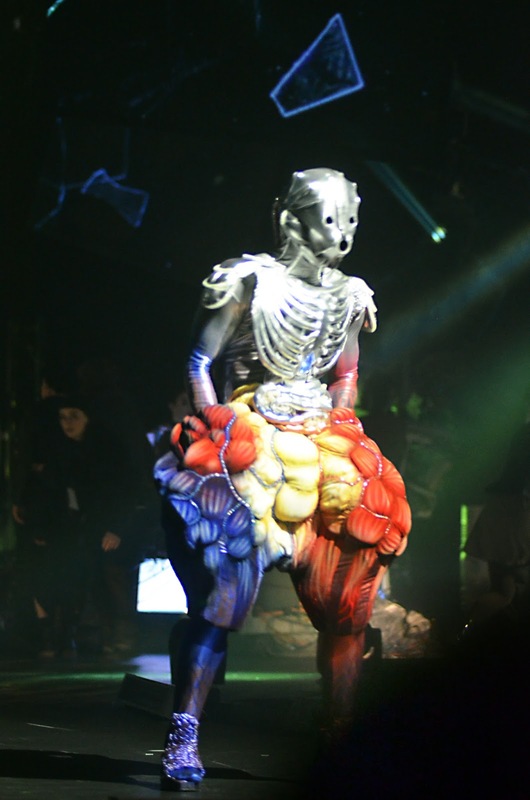 My own interesting character, graced the stage at the World of WearableArts Award show that very night. I had on some shiny silver shoes with no particular expectation of doing anything but dancing in them at the after party. 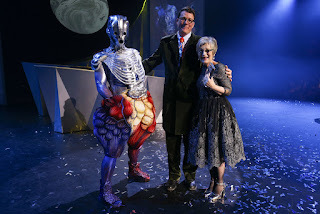 So, when my name was called as the first place winner in the Weta Workshop Other Worlds Section, I nearly fell off them. I did in fact scream. 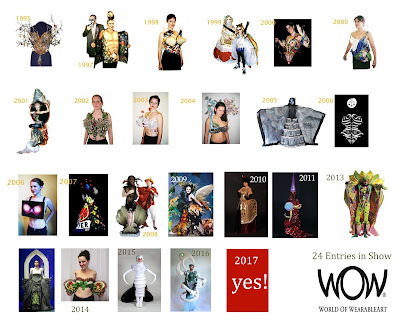 Contrary to popular belief, I have never won a section at WOW in all the 22 years I have competed. I’ve had a couple of seconds and thirds over my 24 finalist garments and I was pretty over the moon about those. But this year, well, WOW! I went on stage to get my trophy and hug Richard Taylor. I may have left mascara stains on his lapel; him being very tall and me being very short, and, well, I was crying at the time. The other part of my prize is to be flown to Weta Workshop to complete a 4 week internship. It’ll be a very short flight on the Flyer bus, as I live 5 minutes away as the crow flies. I’m very much looking forward to spending time there and having a go at a variety of disciplines! My garment, The Organ Farmer was modelled just superbly on the WOW stage and I couldn’t have been happier. My rationale for this fairly nightmarish piece (I didn’t show the pics to my mum in case she thought I’d lost my mind) is as follows in this article and video clip on Stuff. In 3446 the Cyborgs come to a realisation that humanity might have a purpose. Their experimentation however, produces unexpected results. In a heartbeat, this lowly host experiences strange new feelings previously unknown, opening up a world of sensation as the fleshy graft takes hold. My process is on facebook- click through to see how I did it. Don’t forget to like and follow my page; it makes me feel wanted! 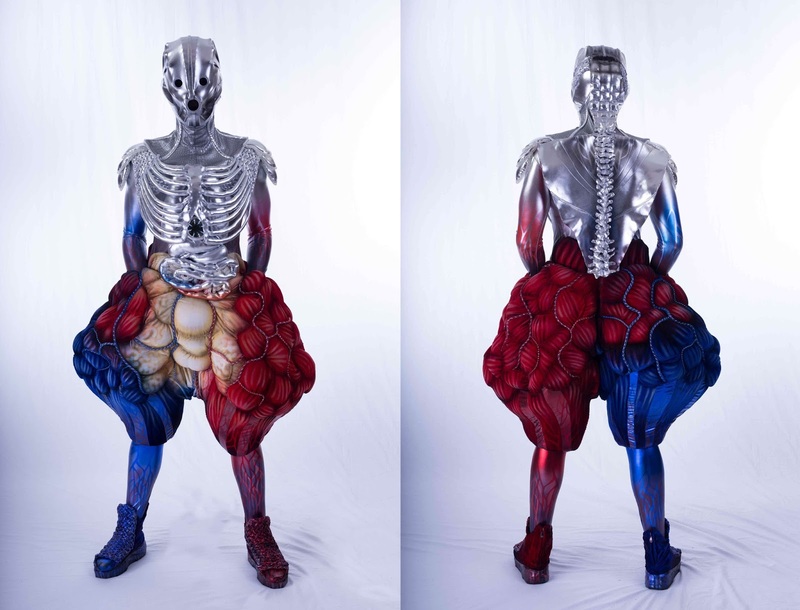 Photos of my final piece by Werner Kaffl who was an absolute pleasure to work with. I finished up the amazing week that was, by flying to Queenstown, and doing a week long tour of Southland schools with Storylines, along with Des Hunt, Scott Tulloch and Barbara Else. We visited and talked to 3 schools at day for 5 days from Queenstown to Invercargill. The weather was awesome, the kids bright eyed and bushy tailed and we had a wonderful time passing on what it is to be writers and illustrators, and in my case a costume designer too. I round off the next week with a free wearable art workshop at Te Papa on Wednesday for kids, and the Storylines National Children’s Writers and Illustrators Hui where I’m presenting a workshop on presenting. It’s what I love, and find fun but others find terrifying. I will help people get over their fear. After that, I can collapse. 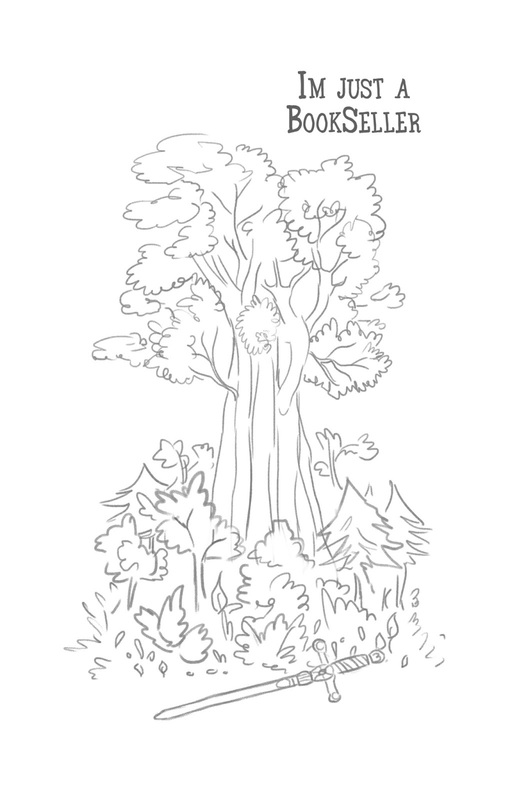 Oh hang on…I have a giant owl to paint for The Big Hoot! World of WearableArt 2017 is...go!!! 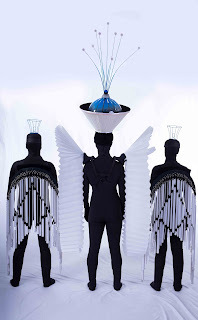 The anxious wait for the results of the first round of judging for the World of WearableArt came through a week ago. This is a day when nothing gets done in a WoW designer's life from 9am in the morning whilst you try and distract yourself by refreshing your email inbox 30 times a minute. As you can imagine, this wears out your keyboard and the patience of everyone around you, be it at home, work or on holiday. As my partner and I work from home, sharing the same office studio with the cat, I had two to annoy all day with my distracted demeanour and attention focussed only on my screen. The computer, my tablet and my phone. Changed days from when I first started entering in 1995, when results were sent out by snail mail which could arrive anytime in the week, depending on where you lived and the postal service! The designer facebook forum started to fill up with pictures of simply amazing pieces that weren't selected. We aren't party to the judges criteria, or to the curation of art for the show. You can only make a piece from the heart, to the best of your ability and hope for the best. If the section has a brief, answer it, if not, design your own brief. My piece for this year was selected for the Weta Workshop Costume and film section, the theme is Science Fiction. Part of the 2017 brief is 'Create an extra-terrestrial being from an alien world or a human being as you can imagine them living in the year 3446'. I've reimagined something in the cyborg realm. Other than that I can't tell you anything except to say it's super creepy and it took me a while to show my family what I'd made in case they thought I'd lost my mind. I love what I've done and once again I pushed beyond the boundaries of what I know I can do into the territory of what I could do if I used my grey matter and learned a few new skills. Each year I learn more and this is what keeps me on the WoW marathon. It's bootcamp for the creative being. Come the award night, I'll be able to post my entry all over social media, so you'll have to wait until September 22nd. I can however show you the piece that didn't get in. Yes, there's always the one that got away. My friend Vicky Robertson and I made this from a selection of recycled items. Her own gorgeous piece got into this year's show too, but whilst our combined entry didn't, we had fun combining skills and effort, and drinking wine when it was all over! 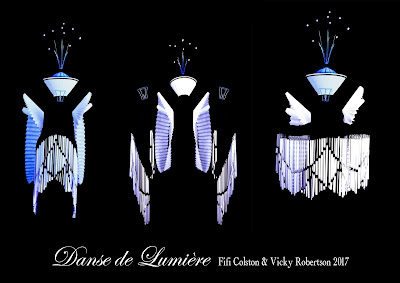 It was for the Illumination section where things light up under UV light, with the theme Float, Fly Flow. Thank you to Werner Kaffl for the photography and to Shonty Rogan for the studio and coordination to get our WoW pieces captured so brilliantly on one fine day in Trentham! The float, fly, flow theme lends itself to a performance piece based on a reimagined interpretation of the French architect, Hector Guimard’s work of 1914. 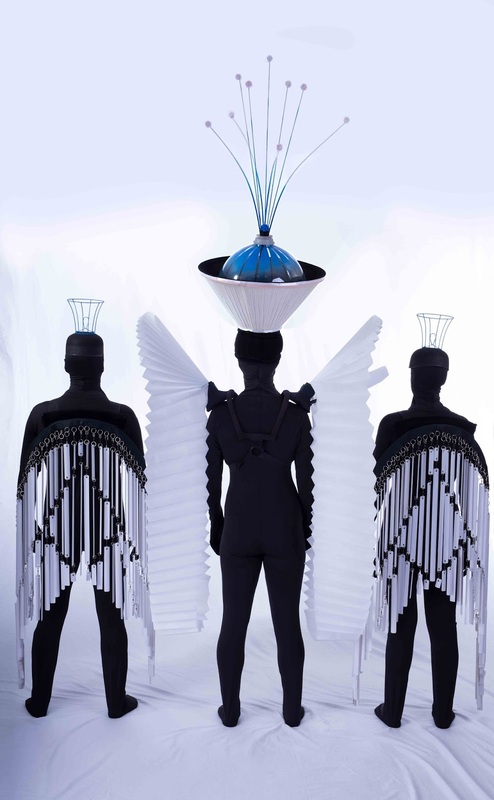 Three separate models, with wing spans and lightshade head pieces, come together in formation, to create multiple concepts for a chandelier. 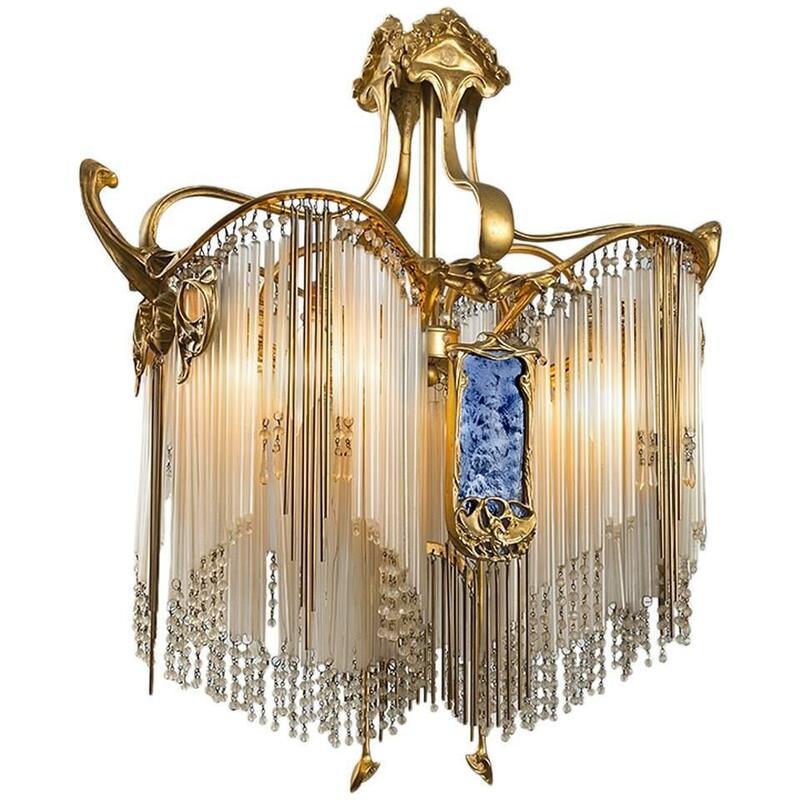 We scoured recycling centers and dumpsters with a portable UV light for the parts that make this entry up. 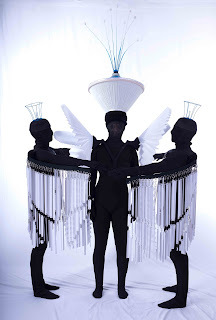 Lampshades, a beer keg bladder, venetian blinds, curtaining rods, spa pool filters and lastly a harness repurposed from a previous UV finalist entry. We purchased the black morph suits and split rings. The entry is open to choreographic interpretation. 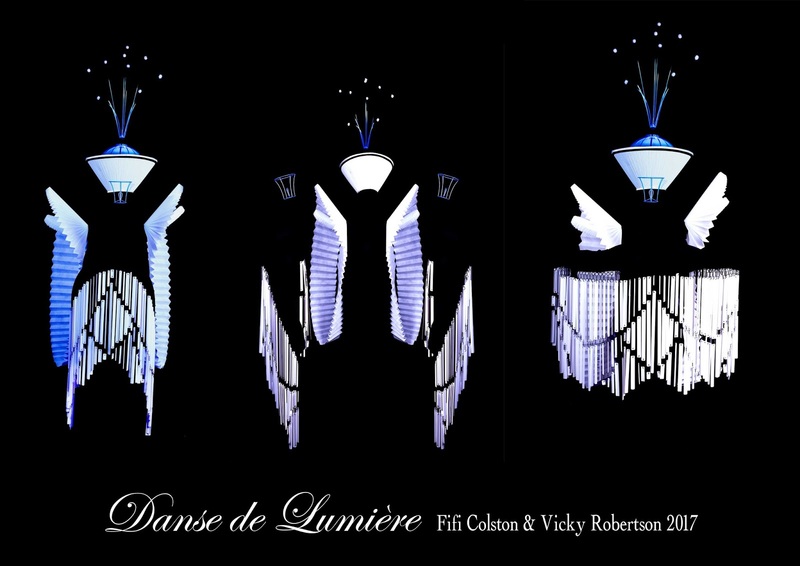 All parts are easy to wear, UV reflective and provide huge scope for movement; floating, flying and flowing across the black stage. 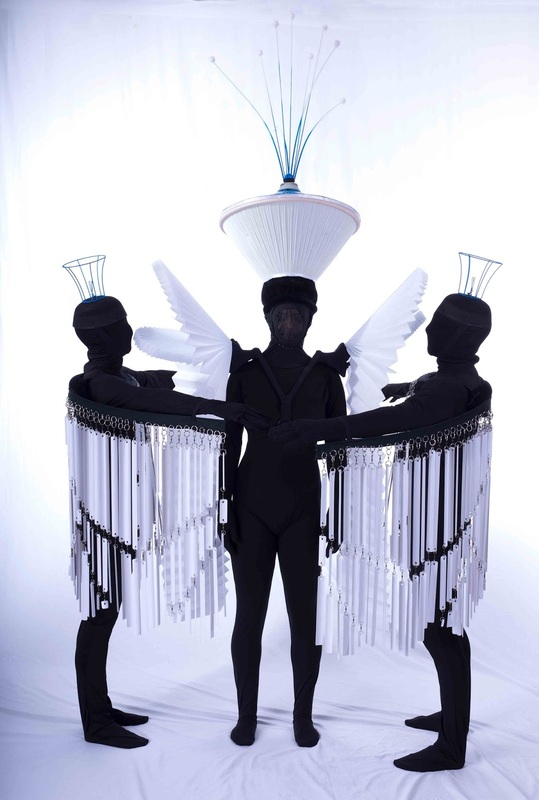 We considered the performance aspects of dance in this creation and what would work for performers to create the final ‘vision’ of light. When it comes back to us, we will take it pieces and recycle the useful bits and back to the tip shop, all the rest will go. So- this first pic is not the entry- it was our inspiration! It's hard to post a transforming, evolving dance, but try and use your imagination here! And here's what our models, Adrienne and James wore in the daylight. They were awesome even with the flu! So, until I post again.... À bientôt! 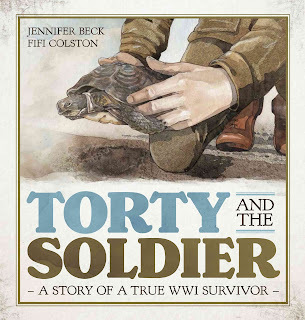 The NZCYA book awards are coming up soon and apart from deciding what frock to wear, I’ve been thinking about the illustration journey I had with Torty and the Soldier, so beautifully written by the very expert author, Jennifer Beck. 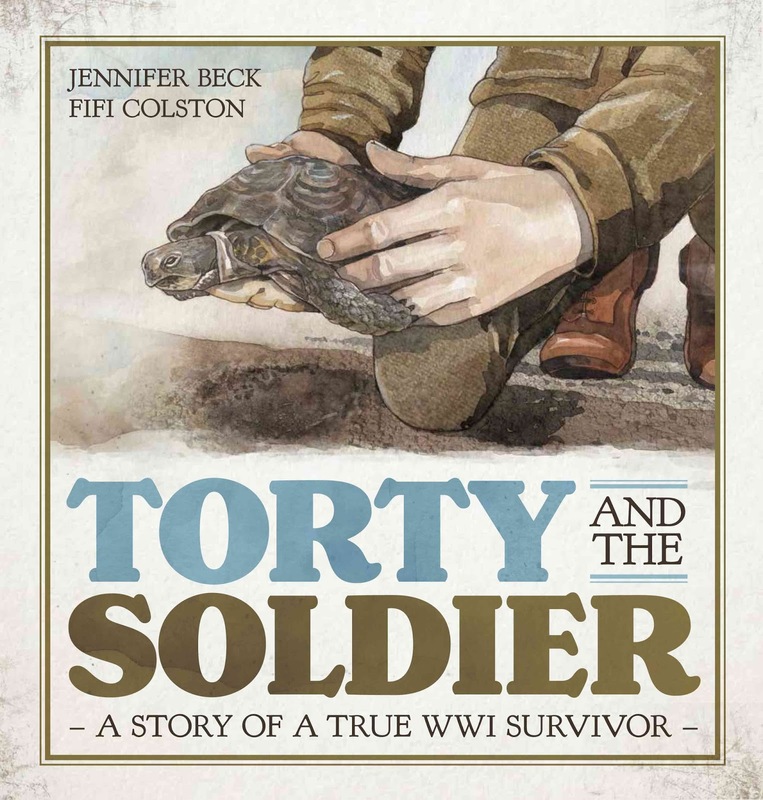 When Lynette Evans at Scholastic asked me if I’d like to read the manuscript with a view to illustrating another ANZAC book, she also mentioned the magic word ‘tortoise’. She’s a clever woman… I have a very soft spot for these hard-shelled creatures. My oldest sister and I had a one each as small children in Britain. Mine was called Sooty after the Sooty and Sweep Show (which left me with a lifetime love of puppets) and my sisters was Big Ears which was irony I missed at the time, given the lack of them on her shelly companion. Tortoises have a tendency to roam far and wide in search of lettuce leaves which usually are in the garden proud neighbours place 4 doors down. They are the Peter Rabbits of the reptilian world. They also hibernate and I remember them in shoe boxes in the bottom of the wardrobe, wintering over. Sometime during this period of pet ownership, our family moved to Ghana in West Africa, and my parents line to this day around the tortoise disappearance whilst packing was ‘they wandered off.’ No amount of plying with wine will make my mother change that 50 year old story. The book’s heroine, Torty (her real name) wandered off, all over the Greece and into the sight of Stewart Little (not the mouse), in 1917 where the story begins. I was entranced by her adventures bought to life by Jennifer’s writing and said yes to taking on the job of illustrating the book. 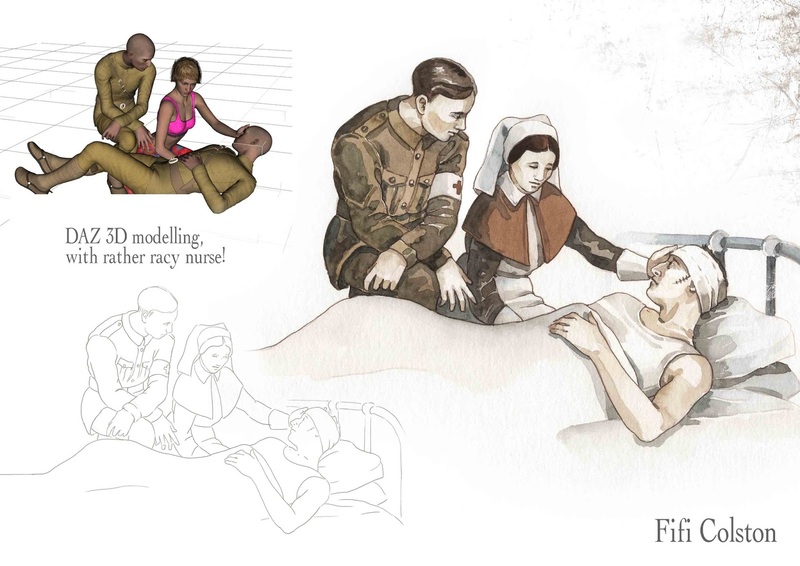 Normally, for a book based on realistic style illustrations, I would find models and photograph them to work from. 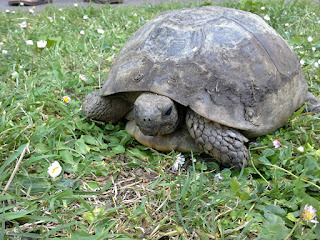 So I paid Torty a visit when she was out of hibernation and residing with family in Havelock North. She has an enclosure that boasts a nesting box and plenty of access to grassy lawn and shady bushes, all with a tortoise proof fence, 25 cm high! She’s a feisty old lady of 200 years and I made my husband hold her whilst I photographed her from every angle. She gave him a good kicking in the process. I also visited the Weta Workshop- made replica of her in the Gallipoli exhibition at Te Papa. She's in a wooden crate and a very good likeness indeed! As for Stewart and his brother, I had no real idea what they looked like apart from Stewart’s military records. Brown hair, hazel eyes. I was also running out of time to find models, so I tried a different method for the first time. 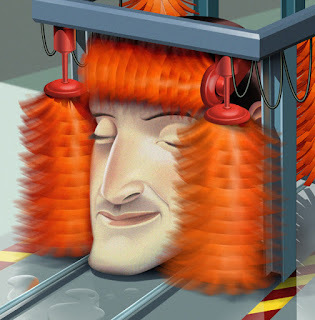 I used a 3D programme called DAZ where I could create people and move them around from all angles. I am no expert with it, but managed to get what I needed by a fair amount of trial and error. The rest was interpretation with watercolours on paper and some digital textures layered on after the scans were done. 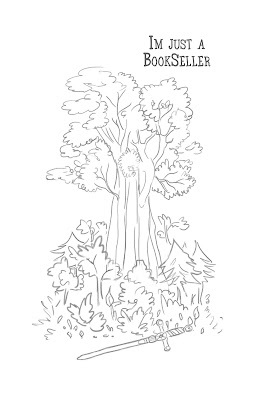 The story moves backwards and forwards through time so we needed to make a distinction between the illustration. I used monochromatic sepia watercolours for the backstory and invited colour into the ‘present’ storyline. Our designer Leon Mackie did a terrific job in a subtle way of dividing those storylines too. And every time I see our cover I sigh with gratitude that Scholastic use great book designers! A book takes time, and by the time everyone in the team has finished their part of the creation, a year has gone by and you are well into other projects. So it is a delight and an honour that when I’ve almost forgotten the months of work we put into it, it is shortlisted as a finalist for the awards. The ultimate acknowledgement. Many thanks to the judges, and I’ll look forward to a night of celebration with some of New Zealand’s best writers and illustrators of children and young adults books. Are you are Design Star?! Each year for the past 3, I've been one of the judges for Brother Design Stars, and I'm doing it again this year! I love this competition because I get to see what amazing, creative, fun things kids from all around the country send in. The prizes are pretty awesome- as a student I would have been floored with happiness to win something to help me carry on making and creating AND the schools get to win too with a massive injection of sewing technology for the school classroom. And as if that isn't enough, the top 12 entries will be showcased on the runway as part of New Zealand Fashion Week’s Graduate Show supported by Brother! PS, here's a vid to get you excited about your work strutting down the catwalk! I was watching Netflix tonight- a series called Abstract. Looking at the illustrator Christoph Neimann, and it made me think about my influences as a new gal on the illustration street. When I was a design student more years ago than I care to admit to, there was a guy in the year ahead of me, quiet, gentle, kind and so very talented. His name was (and still is) Nigel Buchanan. He was the top illustration student- there weren’t formal places you understand, but everyone knew he was the best. There were almost-as-good-as, and they were pretty stunning, but Nigel had that something. A way of looking at the world and producing imagery in a way that we all envied and tried to copy. And on top of that, he was one of the nicest people in the School of Design. Back then, it was Wellington Polytechnic, now it’s Massey University and about as far removed from our faux Bauhaus days as it can be. That might be a good thing, though I have an enduring fondness for the old school that will never fade. One of the hardware features of our pre-computer-age classrooms, were compressed air outlets for airbrushes. One student did a deal with the then, Niven's Art Supplies (became Littlejohns) and got us a collective bargain on Aerograph DeVilbiss super 63 airbrushes; state of the art equipment. Temperamental as hell and fiendishly expensive; I still have mine, thrashed to death over the years. Nigel bought one, and whilst we, the inept, cursed over splatters and bleeding ink, bent needles and clogged tip assemblies, Nigel started producing the most beautiful illustrations, just for fun and to see what ‘that mechanical hand’ (our tutor Roger Hart’s nickname for his pet hate) could do. I remember one evening (all our best work was done at night when the tutors had given up on us for the day) watching him spray, remove a mask, spray, remove another mask and again and again until the final reveal. A woman in a 1920’s bathing suit, rosy cheeked, curls escaping from a cloche cap. I was entranced, it was perfect. For Nigel, it was merely a test piece. A year went by, he graduated. Another year went by, I graduated. I started trying to find work as a graphic designer. I was terrible at it and making no progress at all. One day I visited Nigel in his studio, surrounded with his airbrush, gouache and illustration board. He told me he JUST did illustration work. ‘What?’ I said ‘no fiddling about with getting things ready for print? No type spec’ing? No Bull gum? No waxer? No overlays?’ (note, only designers over the age of 50 will understand any of this terminology). ‘No’ he said ‘I draw and airbrush stuff,' then pulled out some of the work he was doing. I knew in that instant that if I couldn’t actually BE Nigel, then that’s what I wanted to do, and set about mastering the Devil(biss), by trial and error, practicing, practicing and practicing until I had some idea of what I was doing. It finally led me into all kinds of illustration work from photo retouching and product pictures to book illustration and the occasional portrait commission. I worked through the 80’s and 90’s and retired the mechanical hand when pixels became the paint medium of choice. 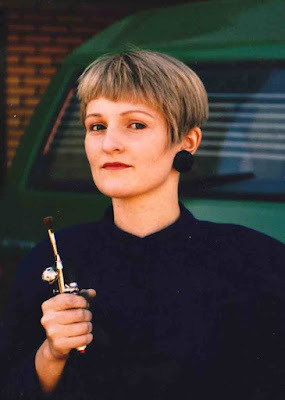 I wasn’t world famous, but I enjoyed a good and varied living as a commercial artist, TV presenter, writer and illustrator. My body of work spanning nearly 40 years now, has morphed and changed until it’s barely recognizable from my first ambition (to be him). I still have my trusty old compressor but I use a cheap Trademe airbrush on occasion to work magic on wearable art and props commissions. I could not have imagined, all those years ago, looking over Nigel’s shoulder, in awe, where my creative skills would take me. I never got to illustrate the cover of the New Yorker, but I’m glad I’ve taken the paths I have. Later this year, I've been invited to show a retrospective of my work (more on that in a few months) and I will have fun trying to make sense of my many layered career. Nigel went onto live in Sydney, than back to new Zealand I believe, and carry his on his work as a highly-regarded editorial illustrator. The airbrush made way for the Apple Mac. His client list includes The Wall Street Journal, MTV, The New York Times, TIME magazine and the New York Observer. He is still a genius in the art of illustration. He’s still my hero and you can see his work here.